Before we get to this week's challenge, I promised I would post my own take on last week's challenge to scrap photos that are 5 years old or older. I dug out some pics of me at five, photographed with my new bike and a favorite dolly, playing happily in my parents yard. 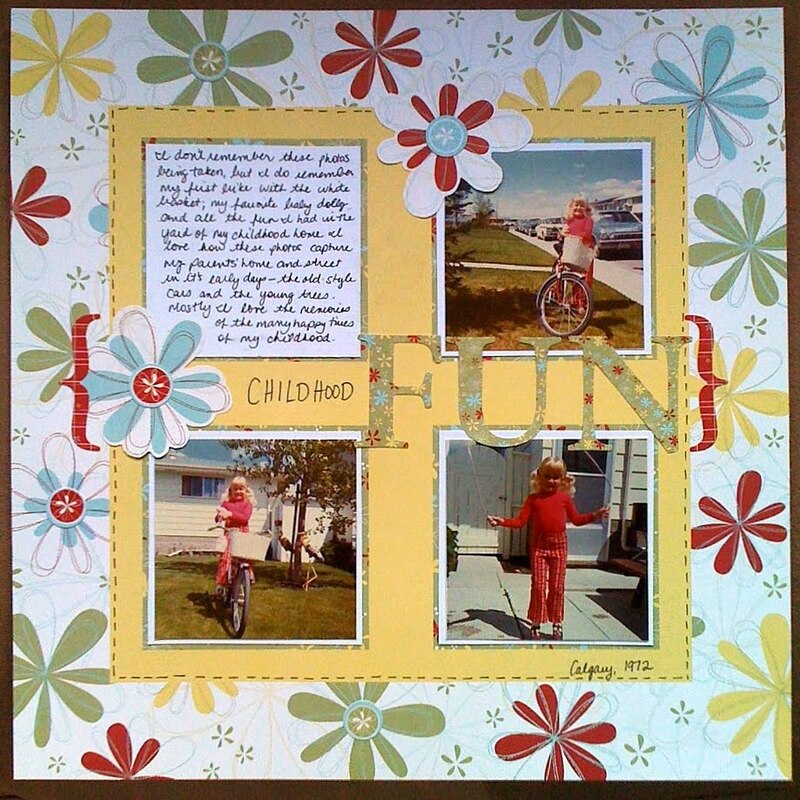 I was happy to put together this layout in a matter of 15 or 20 minutes thanks to a CTMH Level 1 kit that had coordinating papers and embellishments. I purchased a number of these kits from my friend and colleague Carla (who is a CTMH consultant extraordinaire!) when they were offering Level 1 kits at an amazing $4.00 each! I grabbed as many as I could and I am excited that I will be able to put together lots of layouts really quickly! Although the sale is over, check out Carla's website to see the current Level 1 kits and all the other great CTMH products. You can also keep up to date with new promos and sales as they come up. Anyway, it was fun to use photos of my young self and I love the happy memories I felt while I was creating it. Ahhh...the power of scrapbooking! OK, on to this week's challenge! This week marks the beginning of the school year for students in my local school district and in this spirit of going back to school, your challenge is to scrap something to do with learning – a lesson you learned, your child’s first day of school - or your own first day. 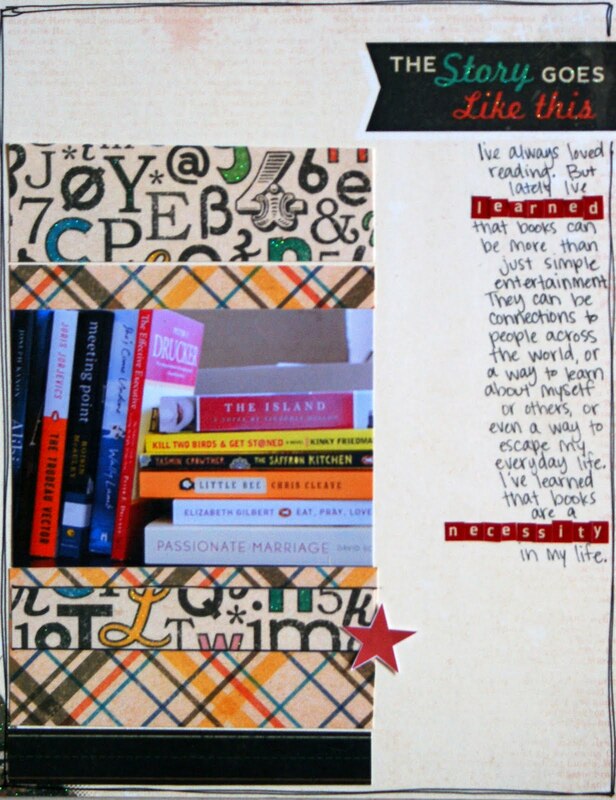 DT member Michelle created this layout about how much she loves reading and why. I love the graphic nature of Michelle's layout as well as the sentiment expressed. Is there something you have recently learned or learned ABOUT yourself? Why not document it this week? And don't forget to post it! Yes, I know I'm a broken record, but we LOVE to see your layouts posted in our flickr gallery. And since we still have two prizes left we need to give one away this week! You have until the end of this week (Saturday September 4th at midnight MST) to post a layout in the flickr gallery and we'll pick one at random to receive the prize. Woohoo! Thanks for the mention Noreen! Much appreciated! Love your layout --- that is one of my all-time favourite paper packs! !